Idea Cellular today declared the launch of recent android powered dual SIM (GSM + GSM) 3G smartphone ideaAURUS (Alcatel 985N) for Rs.7190. Idea Cellular, India’s fourth largest telecommunication operator and one of the highest 3G service providerlaunches new android high-powered 3G Smartphone idea AURUS (Alcatel 985N) for Rs.7190 with enticing 3G datapackage. Its options ar dual SIM, front facing camera for creating video call and added free idea 3G data & voice advantages. Its been priced at Rs 7,190 and can be purchased from Ncarry idea mobile on-line store. 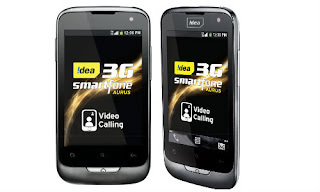 Idea AURUS 3G smartphone features Android 2.3, 3.5-inch Capacitive multi-touch screen, 800MHz processor, 5MP rear camera, front camera with Video Call support, 1300 mAh battery, and dual-SIM (GSM+GSM) connectivity, Hotspot – Support upto 5 device over WiFi and 3G Data speed support 7.2Mbps. Idea is offering special 3G promotional data and voice plans with this handset purchase for each prepaid andpostpaid customers pan india. plan giving 2GB per month 3G data transfer for 3 months, free-calling for 10 minutes for 90 days and free idea TV Rs 150 pack per month subscription for 3months.